Bruce R. Levy, 71, of Port Monmouth, peacefully passed away in his sleep Sunday, December 9th, at his home. Bruce was born and raised in Brooklyn, son of the late Marie and Seth Levy. After meeting the love of his life, Mary Ellen, in Brooklyn, they married and moved their family to Port Monmouth 34 years ago. Bruce served in the U.S. Army during the Vietnam War where he was awarded a Purple Heart. He became a Brokerage Clerk at The American Stock Exchange in New York City. After he retired from Wall Street in 2002, Bruce started his own company, Doody Retrievers. Bruce was a member of the VFW post in Brooklyn and part of the Drug Alliance of Middletown. He was an avid New York Yankees fan. 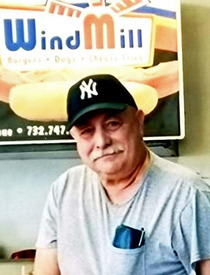 Bruce enjoyed days spent at Monmouth Park and his trips to Wind Mill to get his favorite hot dogs. Bruce is survived by his wife of 36 years, Mary Ellen (Walsh) Levy and their daughters Theresa and Sara. He is also survived by his sister, Susan Levy. Bruce was predeceased by his son Joseph, almost exactly 2 years ago on December 12, 2016, and he left behind the light of Bruce's life, his grandaughter, Amber Marzano. Friends and relatives may pay their respects on Wednesday from 2-4 & 7-9 pm and again Thursday from 1-2 pm, followed by the funeral service at Scott & Kedz Home for Funerals, 153 Church St., Belford.